Support for injections using Mysql, SQL Server, Postgres and Oracle databases. Command line interface. Different commands trigger different actions. 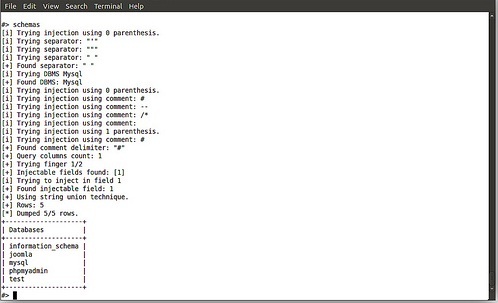 Auto-completion for commands, command arguments and database, table and columns names. Support for query filters, in order to bypass certain IPS/IDS rules using generic filters, and the possibility of creating new ones easily.